1930 Monique Serf was born on June 9th in Paris, Rue Brochant Number 6, near Square des Batignolles in the 17th arrondissement. Her parents, Jacques Serf and Esther, born Brodsky, are of jewesh origin. She is the second child of the family, her brother Jean was barn in 1928. 1939 The family lives in a suburb of Paris. The war begins, the father is mobilized. She moves to Poitiers with her brother. 1940 From May, the migrations begin. The family is always ready to escape with packed suitcases. The family separates. Barbara and her brother move to Châteauroux. 1942 The father returnes to the family. In Tarbes, her brother Claude is born in March. But the jewish family is denounced, they must flee again. Barbara and her sister hide at farmers near Chasseneuil. The family meets in Grenoble for a short time, in July, they move to St. Marcellin in the Vecors. 1944 Barbara has to endure seven surgical interventions on the right hand. In August, Paris is freed. 1945 In May, the ceasefire is signed. In October, the family returnes to Paris to live with the maternal grandmother. Barbara takes her first chant lessons. To the end of the year, her father rents her first piano. In December, her grandmother dies and is buried in Bagneux. 1947 Barbara is auditor in the national music conservatory. 1950 First appearances in Charleroi and Brussels with songs of Edith Piaf, Mireille, Léo Ferré. She calls herself Barbara Brodi. She is not accepted by the audience. Nevertheless first recording of a single record in Brussels. 1953 First successes by the audience. In order not to be expelled from Belgium, she marries the lawyer Claude Sluys, who is also her agent. 1954 Return to Paris. Engagement in the nightclub" l'Ecluse". 1956 Separation from Claude Sluys. 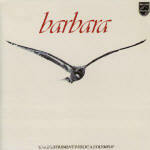 1957 Barbara begins to write first own Chansons, but doesn't venture yet to recite them. 1958 First recording contract with Pathé-Marconi over 3 years. Until 1964, she will be engaged again and again fo some months at the l'Ecluse. She is recording "La chanteuse minuit". 1959 First television appearance in "Discorama." Death of her father in Nantes. 1964 In July, she performs at "Junges Theater" at Göttingen; Germany, for 3 evenings. On the last day, she composes the song "Göttingen." In September, the album" Barbara chante Barbara" appears. In October and November, she performs in the introduction program of George Brassens at Bobino. This brings her the gain acceptance. 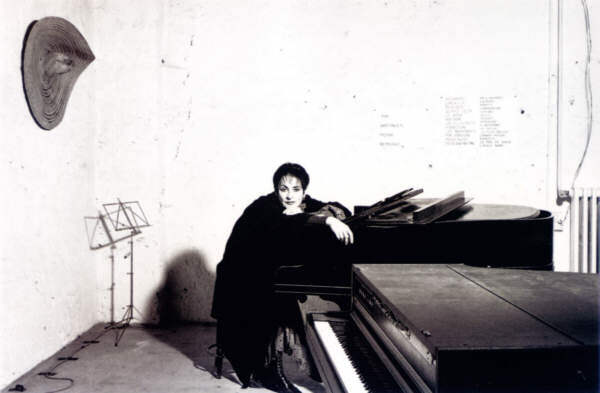 1965 Liliane Benelli, who had accompanied her at the piano in the l'Ecluse, dies at an traffic accident. Barbara dedicates "Une petite cantate" to her. 1966 In December, she sings for the first time "Ma plus belle histoire d'amour" live at Bobino. The album with the same title appears in November 1967. 1967 Tours trough Belgium, France, Canada and Germany with Serge Reggiani. In May, she is recording the album "Barbara singt Barbara - for the first time in german language" in Hamburg. This will be the first and only time, she is recording in an other language. Another solo concert in Göttingen, now with Roland Romanelli, who is from now on her akkordeonist. In November, her mother dies. In December, there is a common project with choreographer Maurice Béjart. 1968 The album "Le Soleil Noir" recorded in June, published in September. 1969 In February concerts at the Olympia, where she is every evening accompanied by George Moustaki to sing "La dame brune". On the evening of the last perfomance on February 17, she announces unexpected to retreat from the stage. 1970 In February, she plays in the piece "Madame", which gets bad critics and is a flop. In May, the album "L'aigle noir" appears. A musical change is to recognize: the company now takes on also electric guitars and synthesizers under the management of Roland Romanelli. 1971 Jacques Brel gives his debut as movie-director with the film" Franz" and Barbara in a leading role. 1972 The album "La Fleur d'Amour" recorded in September 1971appears in March. Already in August, she is recording again, now "Amours Incestueuses" which is published in November. 1973 Barbara moves to Précy-Sur-Marne. She goes to Switzerland, Israel, Canada, Japan, Netherlands on a world tour to Moscow, Belgium, and back to France. In December, she returns to the "l'Ecluse" once again, which is finally closed. 1974 She performs at Théâtre des Variétés. She insists, that the most inexpensive tickets may not cost more than 15 francs. Five years after her triumph at the Olympia, now she says, she realy never has retreated from the stage, she would have needed the distance merely to find the desire again. In June, she takes an overdose of sleeping drugs, is found in time and brought to the hospital. The Chanson" Les insomnies" is created from this experience. 1975 She sings from end of January to beginning of March at the Bobino - here "Les insomnies" for the first time in public. Afterwards, she on tour goes to Japan through the Netherlands, Canada and back to France. 1976 She plays in the (ballet -) movie "Je suis né à Venise" by Maurice Béjart. 1977 In March, there is a fire in her house. It seems to be a miracle, but the fire stops in front og her music room, the instruments remain spared. 1978 In February she appears at the Olympia. In July, Jacques Brel returns to Paris, but to the hospital. Barbara visits him often . Jacques Brel dies on October 9. 1981 In February, the album "Seule" appears. She writes "Regarde" to celebrate Francois Mitterands victory of the presidency elections. She fulfills herself a childhood dream to appear in the circus tent in the Parisian suburb Pantin. She performs there from October to November. Only in the last evening, November 21, she sings the chanson" Pantin." Already in December, the Double-LP appears. 1982 On December 22, she receives the Grand Prix national de la Chanson by minister of culture, Jack Lang. From January 21 to February 19, she performs at "Zénith" with Gérard Depardieu in the piece "Lily Passion", on which she had worked already since 1982. Afterwards, they go on tour to all of France. On July 8, she performs on invitation of Mikhail Baryshnikov at the Metropolitan Opera in New York. She sings, he improvises a choreography to "Pierre", "Une petite cantate" and" Le mal de vivre". She begins with her personal commitment in the fight against AIDS. From September 16 to October 11, she performs at Théâtre du Châtelet. She wrote "Si d'amour at mort" and transfers all rights and profits for this chanson to ACT UP (Aids Coalition To Unleash power). To that time, there have been many ACT UP-Groups worlwide. Here in Germany it was not easy to receive money for activities. Therefore, it is especially to mention, that Barbara did this as an artist to set a sign to the public. Afterwards Barbara goes on tour through France with this concert. 1988 The tour goes on through Japan, Canada and back to France. On September 15, she receives the medal of honour "Chevalier de la Légion d’Honneur" by President Mitterand. In the same year she also receives the medal of honour from the german city Göttingen. On December 1st, the annual world Aids day, she announces that she will work for one year in the fight against AIDS. She visits sick persons in hospitals and sings in prisons. From February 6 to April 14, she gives concerts at the Théâtre Mogador. The Live-recording appears under the title" Gauguin" on Double-CD in May. Afterwards, she tours through Switzerland, France, Belgium, and in autumn again to Japan. 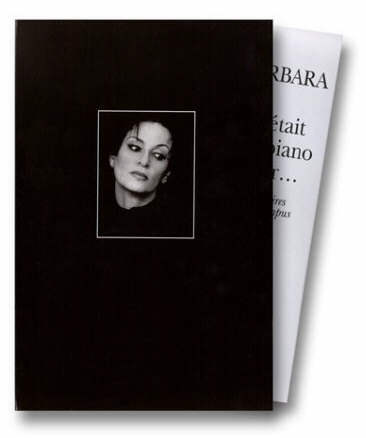 1992 On the conception of the 13 CD-box "Ma plus belle histoire d'Amour... c'est vous" Barbara was participating watchful. 1993 The concerts announced for February must be cancelled because of healths problems. Now there is new contract for performing from November 6 to December 31 at Théâtre du Châtelet. Already in the beginning of December some concerts are cancelled because of Barbara's health constitution. The live receptions for the Double-CD (published in February 1994) are taken December 11 to 13. December realized. Then, the row is canceled. On December 14, Barbara is in hospital with a mutual pneumonia. 1994 Despite dissuasion of her doctors, she goes on tour again end of January. In February, she gives a concert at Montpellier and receives the "Victoire", the prize for the best interpreter of the year. This prize is very important in France, comparable to the American" Grammy"-Award. On Saturday, March 26, she gives her last public concert at Théâtre Vinci at Tours. 1995 Barbara tries to get some rest. But she wants also to take care of people with Aids. She lets install an extra telephone connection, where patients can talk to her. At this time, she also discovers her passion for the fax-machine (we will understand this later with her chanson on the last studio-album). 1996 In January she is planning a new studio album. She writes and rehearses with her musicians at her home in Précy. The last album titled just "Barbara" appears in November. For the chanson "Le couloir" she transfers the rights and profits to ACT UP again. In December she begins writing her memoirs. In February she gets the information to receive again the "Victoire" as award for the best interpreter of the year. She expresses her thanks by telephone. She is now writing her memoirs, which will later appear - unfinished - with the title" Il était un piano noir...". She still supports social and caritative instituions. On November 12, the Double-CD "Femme piano" with digitally remastered versions is published, on which conception she is decisively involved. On Monday, November 24, at 3 o'clock in the morning she is brought into the hospital of Meaux by the rescue service and later transferred to the American hospital of Neuilly, where she passes away at 16:10h. Her death is made public not before the following morning. On Thursday, November 27, Barbara is buried on the cemetary of Bagneux beside her mother, in the grave of the family Brodsky. Everytime, when I put one of my Barbara-CDs into the player, this means, that I will listen to Barbara for days - or weeks - exclusively. Her superior style is for me so absolute and gives an atmosphere, which can't be interrupted - or even replaced - by any other kind of music. there will be nothing after.